Children will be swept up in their own playful ideas as they explore a boat, engage with stories, and use their imaginations to transform into human and animal characters. Surprises are in store for the youngest Crocker Art Museum visitors, as artist Martin Webb transforms Tot Land into a new Art Spot designed specifically for children ages 5 and under. Funded in part by in the Institute of Museum and Library Services (IMLS) and First 5 Sacramento, the Crocker Art Museum’s experimental Art Spots program features four experiential, hands-on installations with the youngest art lovers in mind. Each Art Spot is created by a different artist or team who spent the last year working closely with the Crocker’s education team to gain a thorough understanding of children’s’ developmental needs and interests. Crocker educators selected Martin Webb to take on the unique task of creating a new installation for Tot Land, a long-time favorite learning space of children who like to play and release energy as they explore the Museum with their caregivers. Originally from England and now based in the East Bay, Webb is primarily a painter, but also creates prints, is a sculptor, and makes public art. His work combines simple depictions of natural and human-made landscapes, with imagery that often reflects his personal thoughts as both an immigrant and world traveler. To gain inspiration for Tot Land’s Art Spot, Webb explored the Crocker permanent collections, and as he lingered over an object in the Oceanic Art gallery, an image of a giant boat came to mind, as concepts of adventure, travel, and exploration took shape. 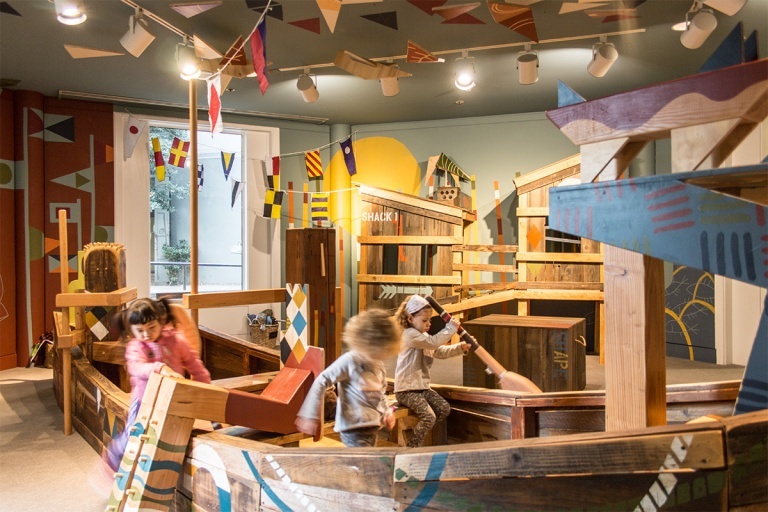 Webb’s design invites children to climb inside the raw, wooden boat and imagine glorious adventures on the high seas, as they are surrounded by friendly human figures, animal symbolism, geometric abstractions, and an earthy color scheme that is both mysterious and playful. Adults can join them, but the scale is child-sized so children can inhabit the space and be immersed in their own scenarios, narratives, and role play.